Sporting a very attractive silver finish is just one of the highlights of this swimming dog tag medal. 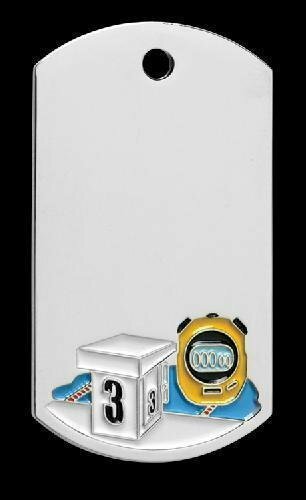 A digital stop watch, starting block, and pool complete with lane markings is located at the bottom of the dog tag. Measuring 2" X 1" leaves plenty of room on both the front and back to handle any engraving needs. The swimming dog tag can be presented as either a key chain or a neck worn award providing you the ultimate in flexibility. Sporting a very attractive silver finish is just one of the highlights of this track dog tag medal. A black track shoe with white wings is located at the bottom of the dog tag. Measuring 2" X 1" leaves plenty of room on both the front and back to handle any engraving needs. 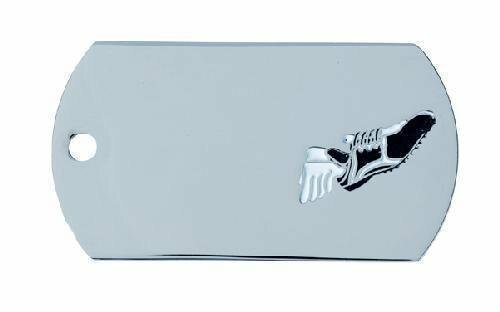 The track dog tag can be presented as either a key chain or a neck worn award providing you the ultimate in flexibility. Sporting a very attractive silver finish is just one of the highlights of this volleyball dog tag medal. 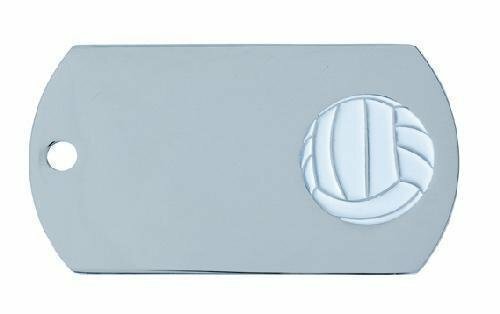 A white paneled volleyball complete with grey outlines to highlight the panels is located at the bottom of the dog tag. Measuring 2" X 1" leaves plenty of room on both the front and back to handle any engraving needs. The volleyball dog tag can be presented as either a key chain or a neck worn award providing you the ultimate in flexibility. 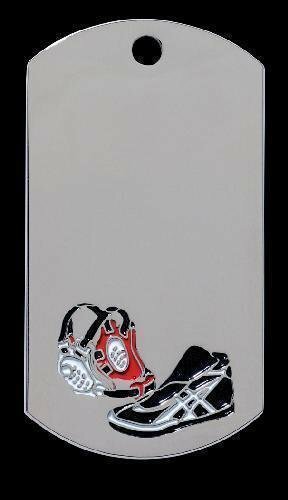 Sporting a very attractive silver finish is just one of the highlights of this wrestling dog tag medal. An iconic wrestling headgear and shoes are located at the bottom of the dog tag. Measuring 2" X 1" leaves plenty of room on both the front and back to handle any engraving needs. The wrestling dog tag can be presented as either a key chain or a neck worn award providing you the ultimate in flexibility.